The Mediterranean aquaculture industry is supplying steadily high volumes of fish. The development of new fish products for new customer segments can contribute to the expansion of the market and the long-term competitiveness of Mediterranean aquaculture. The aim of the study reported in this deliverable (Deliverable 5.2) is to identify market segments, evaluate their potential for new fish product adoption and profile the key segments. In order to identify and profile consumer segments that are promising for new aquaculture fish products, data was collected in three European countries, Spain, Germany and France. Across the three countries, 1500 consumers answered a questionnaire and provided information regarding their food-related lifestyle, the frequency of buying and consuming fish, several psychological characteristics related to fish or aquaculture fish as well as socio-demographic characteristics. Based on people’s food-related lifestyle, four consumer segments were identified and described. The first segment can be named the Adventurous Food Consumer (34%). These consumers are generally interested and involved in all aspects of food. They look for innovative products and are also very responsible as consumers, e.g. evaluate sustainable solutions. This is one of the promising segments for new aquaculture fish products as consumers in this segment are highly involved with the fish category, they are most familiar with the species under focus in MedAID, they are frequent buyers and consumers of fish and they have a strong intention to buy new aquaculture fish products. The second segment can be called the Conservative Food Consumer (29%). These consumers are not very interested in change and innovation, but rather look for stability and well-known food. They do not care about responsible solutions more than the average, and their involvement with food is a bit below average. 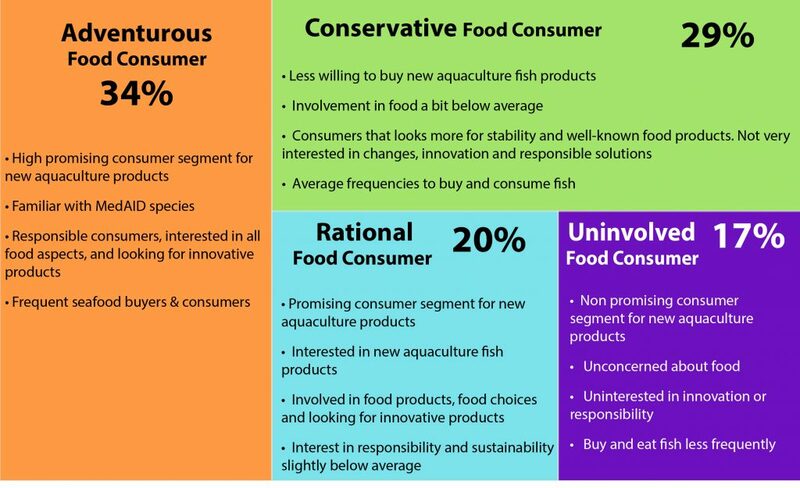 These consumers are similar to the next consumer segment (“the Rational Food Consumers”) in some psychological characteristics and fish purchase and consumption frequencies . However, they are less willing to buy new aquaculture fish products. The third segment can be labelled as the Rational Food Consumer (20%). These consumers are involved with food products and food choices, they look for innovative products and new recipes. Their interest in responsibility and sustainability is slightly below average. These consumers are interested in new aquaculture fish products and therefore, they can be seen as a promising consumer segment for the aquaculture market. The last segment can be called the Uninvolved Food Consumer (17%). These consumers are generally unconcerned about food and they are also uninterested in innovation or responsibility. They seldom buy and eat fish and they have low interest in buying new aquaculture fish products. Therefore, they do not raise much expectation for the adoption of new aquaculture fish products. actors.